A 64 y/o male with a history of HTN presents with chest pain x 1 hour. When an EKG demonstrates both ST elevations and Q waves in the same leads, this is diagnostic of an evolving MI. This suggests that the MI has been ongoing for several hours and some myocardium has already died (represented by the Q waves) and can not be salvaged by reperfusion. However, the persistence of ST elevations indicates that there is still some myocardium which is salvageable with intervention. Thus, emergent reperfusion is indicated. 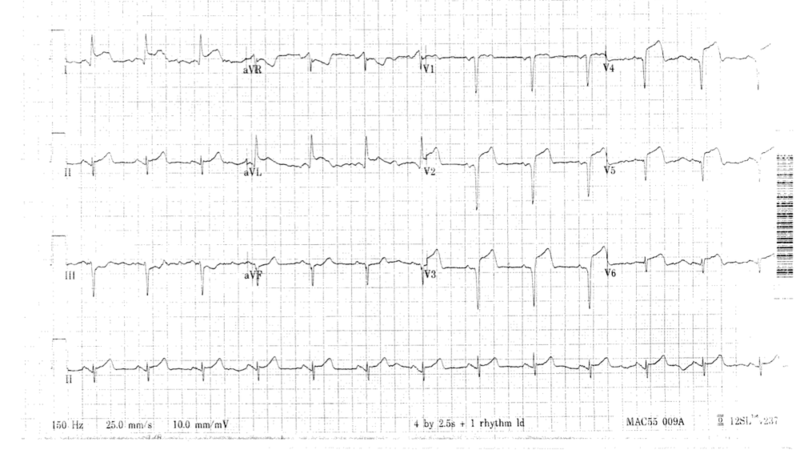 Q waves are generally representative of irreversible myocardial necrosis but are rarely the sole manifestation of AMI. Pathologic Q waves may emerge within the first hour of infarction but most commonly develop 8 to 12 hours into the infarction. It follows that ST segment elevation with concomitant Q waves does not preclude consideration of emergent reperfusion therapy. Q waves may persist after MI as enduring markers of previous infarction on the ECG; in some cases, however, Q waves disappear with time regardless of whether the infarcted territory was reperfused.